The Gizmodo article Australian Siblings Are Semi-Identical Twins, Some of the Rarest Humans Ever links to the new paper in NEJM Molecular Support for Heterogonesis Resulting in Sesquizygotic Twinning Gabbett et al. N Engl J Med 2019; 380:842-849 DOI: 10.1056/NEJMoa1701313. sesquizygosis and sesquizygosity: A postulated form of twinship, in which individuals share between 50 and 100% of genetic identity by state (number of shared alleles). 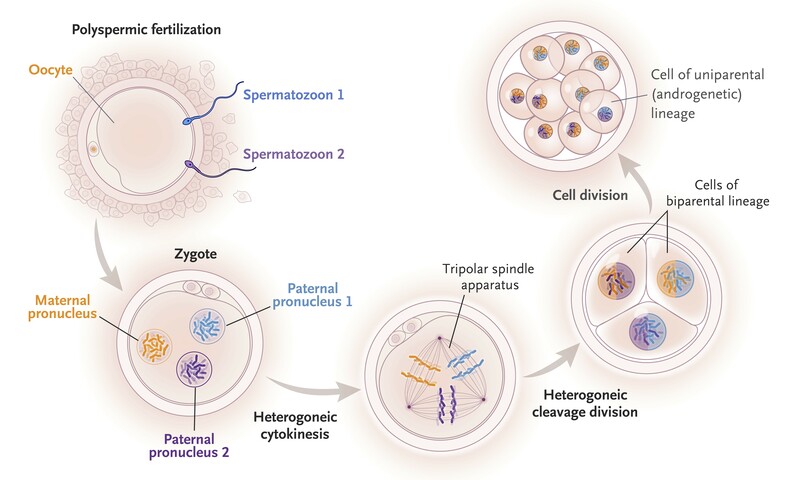 heterogonesis: The assortment of two or more paternal genomes into distinct cell lineages after polyspermic fertilization of an ovum. So far I understand that the chimerism means for each fetus, some cells have a distinct genome from other cells, and sesquizygosity means (at least) that there is DNA present from more than one sperm. But I don't understand what "...chimerically shared 78% of their paternal genome..." means exactly when speaking about twins. What does chimerical sharing mean in this case? Are we talking about four genomes (two genomes in each of two fetuses)? If so, how does that comparison reduce to a single value of 78%? The assortment of two or more paternal genomes into distinct cell lineages after polyspermic fertilization of an ovum. This term — chimerical sharing seems to be used only in this study as a google search did not return any other results. So, it is not a standard term. I believe what they mean by this term is that the twins shared x% of the paternal genome but the sharing is not homogeneous for each cell. In other words each twin has some cells with genetic material from sperm-1 and the others with genetic material from sperm-2. If the two sperms were genetically identical, then you would not see any chimerism. Let's now consider only one allele as a marker of paternal parentage. So, there will be two populations of cells for each allele. If both populations are of the same size then you would have 50% chimerism in a single individual (i.e. the allele frequency). The percentage of chimerism may be different between the twins. Now, there may be several genomic regions at which the paternal-genomes differ. Since the paternal chromosomes would not be symmetrically partitioned between the blastomeres, the different genetic markers (alleles) are likely to have different extents of chimerism. In this study they measured the frequencies of a few SNPs that were informative for deducing the parentage. Analysis of SNPs from twin amniotic fluid and parental blood showed that 265,489 maternal and 179,205 paternal SNPs were informative for parent of origin. They noted that ~78% of the paternal SNPs were found in both the twins. Of these, the twins shared 265,400 maternal and 139,155 paternal SNPs, which makes them 100% maternally identical and 77.7% paternally identical. Note that this is just a qualitative test for the presence or absence of the alleles. This does not say anything about the extent of chimerism of different alleles. (There are some figures in the supplementary data for the frequencies of different SNP but they are not in a tabular form and hence difficult to deduce). Not the answer you're looking for? Browse other questions tagged genetics molecular-genetics genomics twins chimerism or ask your own question. What does this equation about DNA replication mean?